Humans are the only animals that cook their food, an innovation that changed the course of our evolution and the trajectory of the planet. But how did we tame those early cooking fires and put them in a box—and what can subsequent leaps forward in heating technology tell us about cuisines and culture? This episode, we’re taking you on a whirlwind tour through oven history and science, from the legendary roast beef of Old England—and the special dogs bred to turn the spits on which it hung—to the curious origins of the microwave in military radar technology. What do we gain and lose when our ovens change—and how might understanding that help with the quest to bring better cookstoves to the developing world? As biological anthropologist Richard Wrangham has convincingly argued, cooking was revolutionary. Heating raw food over a fire made more of its calories available and reduced the work required to digest it, freeing up so much time and energy that our ancestors could develop large brains, language, culture, and, eventually, all kinds of new cooking technologies. Inventing the techniques and technologies that moved us beyond an open fire, though, took time—both to develop and be adopted. This episode, we travel with food writer Bee Wilson and historian Sara Pennell to 1600s England, to tell the story of one culture’s challenging transition from hearth to enclosed oven—a story that starts with a wood famine, involves the demise of a specialist breed of dog and a nostalgic song about the lost art of roasting, and ends up effecting a radical redesign of both the art of cooking and our relationship with fire. In the late 1800s, the introduction of the gas oven tamed fire, making it something to be switched on and off at will, rather than carefully tended as if one’s life depended on it (which, in fact, it did). In the twentieth century, the microwave promised to eliminate fire altogether, drawing on military technology to cook food using friction rather than flames. With the help of food science guru Harold McGee, sociologist Elizabeth Silva, and engineer Ashim Datta, we explore the futuristic promise of the microwave, as well as the science behind its failure to live up to the bold claims made on its behalf. Finally, although ovens have come a long way in the developed world, an estimated three billion people around the world still cook over an open flame or inefficient wood stove. Writer Michelle Nijhuis spent time in Guatemala to experience some of the environmental and health impact of these cooking fires, which produce the equivalent of about 400 cigarettes’ worth of smoke every hour, on their users and the planet—and to try to understand why 40 years of efforts by non-governmental organizations to deal with this problem have still not been completely successful. Can the lessons of 1600s England offer any insight for helping twenty-first century Guatemalans? Listen now! Bee Wilson is a food writer and author of Consider the Fork: A History of How we Cook and Eat, among other books. She’s a Gastropod regular, having starred in our very first episode, “The Golden Spoon,” as well as “First Foods: Learning to Eat.” In Consider the Fork, she vividly extols the roasting skills of British food historian Ivan Day, whose work can be found online here. “The Roast Beef of Old England” was written by Henry Fielding and first performed in 1731. The lyrics are here, and you can hear an arrangement here. 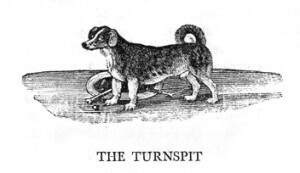 For more on turnspit dogs, this Kitchen Sisters post is fun. Sociologist Elizabeth Silva teaches at Britain’s Open University. Our interview drew on her article, “The Cook, the Cooker, and the Gendering of the Kitchen;” this article is also a fun introduction to some of the gender issues embedded in early microwave advertising. Writer Michelle Nijhuis traveled to Guatemala to write about cookstoves for National Geographic. You can read her article, “Three Billion People Cook Over Open Fires―With Deadly Consequences,” online here, and learn more about the Global Alliance for Clean Cookstoves here. The post Hotbox: The Oven From Turnspit Dogs to Microwaves appeared first on Gastropod.